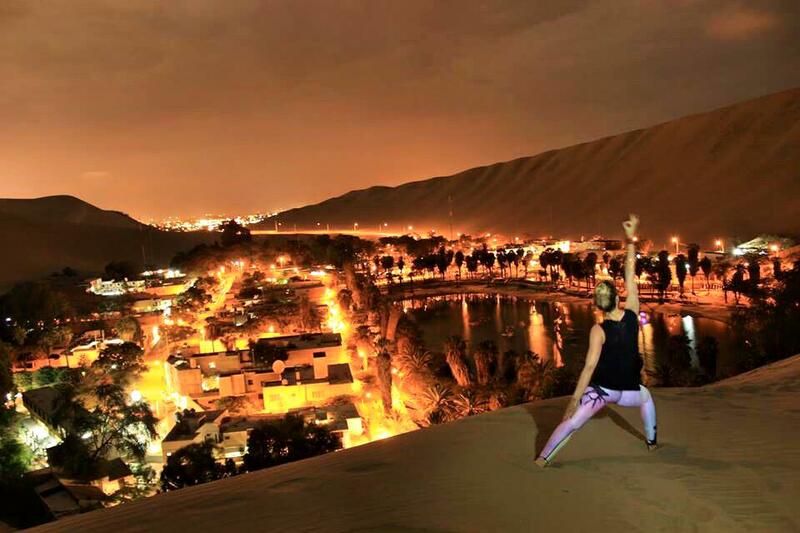 Ahhhh Huacachina, the dream-like desert oasis we fantasize about does exist. And it is truly magical. Ryan and I arrived in Ica early evening and we headed straight for the dunes. We trudged up the sand laughing as each step we took we sunk back two. After a bit of a struggle we made it to the top and gasped over the beauty laying before us. The tiny oasis city was brightly lit and looked like a slice of paradise. The mountainous sand dunes looming over us, a red glow circled the almost full moon, and the perfect night temperature we Chicagoans have been craving for. I sat there in awe thinking all I need is a genie and a magic carpet ride to complete the fantasy. The next day we booked the dune buggy/sand boarding adventure tour and thankfully friends we met recommended Chupon for the wildest driver around. Paying only $7 (the most fun per dollar ever spent) we hopped on the buggy with a group of eight and headed out for the sunset experience. Once Chupon got going holy hell did my screams (the good kind) start. He drove that thing with no fear flying over huge dunes, off crazy drops, and if we weren’t buckled in there was not a chance we would survive. When pulling up to the sand boarding spot he flew in so fast that people started running in the opposite direction. Too great. 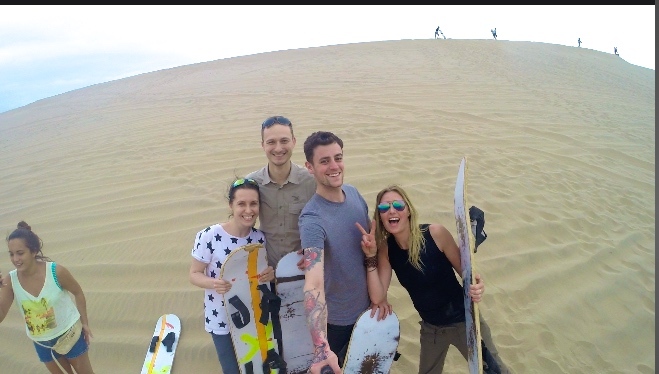 The first extremely steep dune, we waxed up the boards and took off on our bellies. Crazy fun. The next few dunes we had the option of attempting to sand board. Being a somewhat confident snowboarder, I figured it would be easy. Unfortunately the “boards” are basically a crap piece of wood with velcro straps to wrap around your shoes. I quickly figured out carving would not be an option. I stood up hoping my feet would stay attached to the wood and off I went. I’m proud to say I successfully made it down without falling until the bottom flattened out. I helped others attempt and our entire group successfully sand boarded down. We continued this over and over and I loved it. I could only imagine the shredding I could do with a proper board and boots ha. There are world championship tournaments held in Huacachina and apparently these guys are nuts. I’d love to get the chance to watch them tackle mile high dunes. Chupon took us to a few more dunes and a spot for photo ops and then we climbed aboard his buggy for one final wild ride. He asks, “Want to go fast? Want to go crazy?” “YES,” we all said in unison and then he tapped on his tip sign and we laughingly agreed. This time Ryan and I switched for the back row. Bad move. I thought I was going to end up with a concussion as I tried to hold on for dear life. We made it back alive and thanked our wonderfully insane driver for the best adventure yet. That night Ryan and I decided to once again climb above the city to take night shots on his SLR camera. After playing around in the sand we challenged ourselves to hike up the tallest dune around. Slow and steady and about a half hour later, we summited the dune. From that height we could see miles around. City lights glowed below. Walking up took 30 minutes and running down took about two. 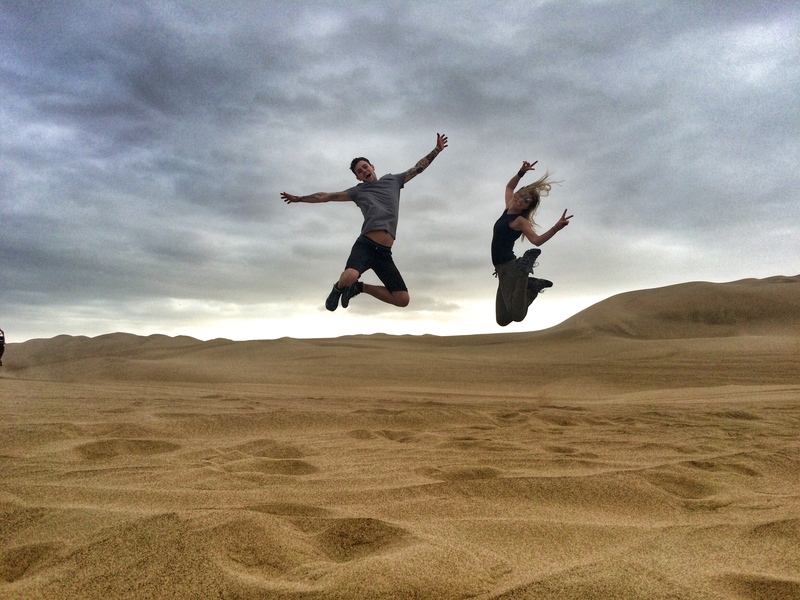 I had no idea how much fun mountains of sand would be and I’m extremely glad we chose to swing through this city. Arriving early evening in the town that only popped up when an American scientist discovered the lines while flying across the barren region in 1939, Ryan and I knew we were going to enjoy this small city. Our tiny hostel was a Peruvian/Dutch run home with only a few rooms and a relaxing rooftop terrace. We spent our days wandering the town, eating fulfilling set meals for $3, and observing the locals whilst sipping cheap lagers in the town’s Plaza de Armas. 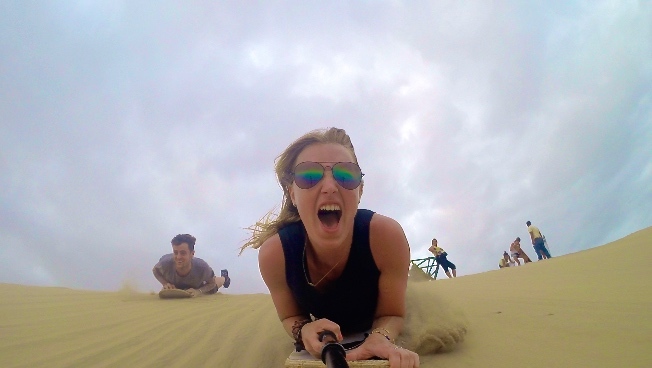 We were often confronted by tourists agencies to take flights over the lines, participate in more sand dune adventures, and visit mummies that have sadly been robbed by pirates years ago, but we chose to skip it all. We thought about it flying over the lines but in the end we decided the flights were too expensive ($75/pp for 30 minutes) and not to mention dangerous. 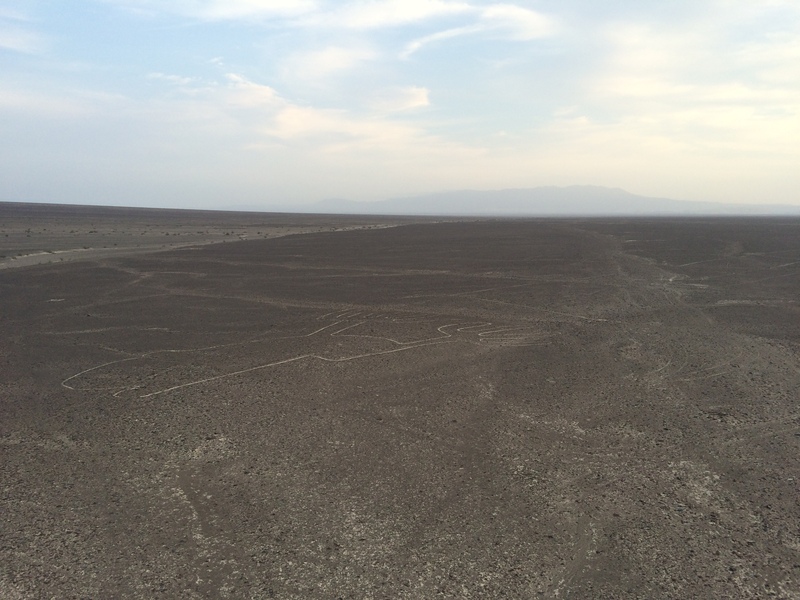 Although we knew it would not be the best shot of the Nasca lines, we headed to the Mirador (lookout tower) to catch a glimpse. Even climbing the tower felt unsafe as it swayed in the strong wind and reaching the top we could only laugh. Two small designs were visible, the hands and the lizard, but barely. A taller rock formation stood south and we took off in an attempt to see more. Just geometrical lines from this view, but we made it for the sun’s last stretch. It was beautiful in the middle of nowhere, the sky different colors in each direction, and the dry, rocky mountains sheltering us in the distance. From here we would have to flag down a bus heading to Nasca. Each time we stuck out our thumb, the cars, trucks, buses sped up (yes you would be happy to hear hitchhiking was not successful). Our only chance was walking back to the Mirador and hoping the locals could help. Thankfully they were still packing up in the pitch dark and after fifteen minutes we were on our way back to town.